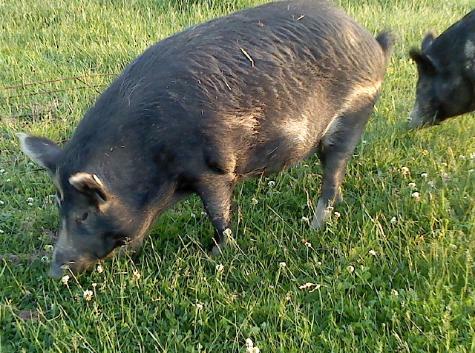 feeder pigs, ossabaw island boar, osaabaw island gilt, ossabaw pig, ossabaw pork, ossabaw meat, ossabaw island pigs for sale. are given no vaccines, no added growth promoters/hormones, and no antibiotics. much healthier choice to feed your family. are unhealthy and contribute to poor quality pork. Our pigs are treated humanely and are handled gently. tolerating low quality commercially raised meat. texture, and actually has color and taste. This is not the other white meat!! That is because Grandma didn't get her pork from a big box grocer! !